She could have thrown a fit, broken dishes against the wall, yelled obscenities at me like Ms. Tollbooth-Operator-And-Change-Maker (who, as you can see, has NOT been featured yet because of that sassy attitude) when I came to frequent her restaurant for having to wait months for her debut, but…the Luby’s lady didn’t. She is a lady of class and one to be admired. Growing up, we always went to the same Luby’s and had the same lady roll around to our table with her cart of tea, water, sugar, napkins and small snakes dipped in honey and rolled in pecans. (If you caught that last part, you are definitely reading this post and have been designated to receive all of my valuables when I die. Be sure to mention that part below if you want some sparkly diamonds). I always wondered if she wanted to be the lady who cut my fried fish in half for the LouAnn Platter or if she coveted her position on the floor refilling tea. I think she loved that tea job. She was always smiling anyway. Maybe it was because I followed her around tickling her right in her fleshy armpits. I don’t know. All I know is, it’s Luby’s turn! It’s another day with your head under the hot heat lamps while your hands swelter in the sauna made by the plastic gloves, but you don’t care. 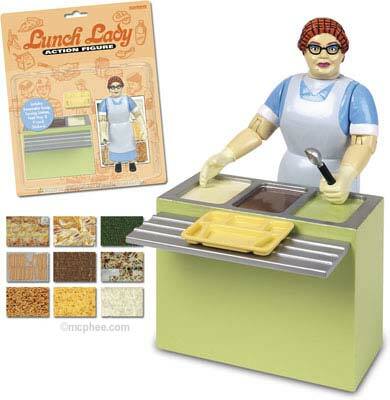 You don’t care because scooping up beans, squash, potatoes and Salisbury steak is the game and, after all, Ms. Luby’s-Cafeteria-Worker-and-Food-Scooper is your name. 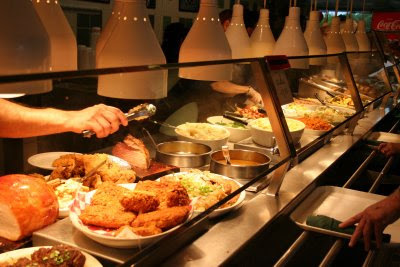 You pride yourself in how quickly you can plop a dollop of tartar sauce by the fried fish while simultaneously passing it to the left without dropping eye contact with your customer because you know it all comes down to how quickly that line moves and all eyes are on you. That is why it burns you up when that little girl…that old lady…the teenager on her phone…and that wrinkled old man…can’t….decide…what…they…want. You enjoy your job because you used to call yourself a “people person” and turnip greens used to just call your name, but the stress…and the heat lamp burn…sometimes becomes too much. You have begged and begged to be moved to the jello and salad area at the beginning of the line because of the cooler temperatures and also because of the fact that nobody hardly ever wants salad. Their eyes are glued to the liver and onions, which absolutely would allow you to have that much needed break. But, nope…your manager wants you right in front of the steamin’ macaroni and cheese…that always needs to be refilled. So, crack open a new package of sauna gloves, Ms. Luby’s-Cafeteria-Worker-and-Food-Scooper, and know that your smile and efficiency are the REAL reason people return to Luby’s again…and again…and again…and again (also, that sweet tea hits the spot, as does that red jello…and that chocolate pudding…).